The hospitality industry is constantly changing and, with new trends constantly appearing, the industry continues to grow. 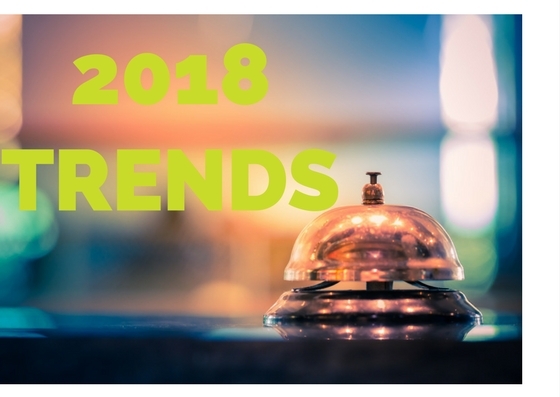 Let us take a look at what we think will affect the hospitality industry in 2018. We have a lot to look forward to, as new technology is being implemented and businesses become more innovative. One major trend that will affect the hospitality industry is the increasing use of technology. This could be through the implementation of smart rooms. Towards the end of last year Hilton was testing its first mobile-centric hotel room, where guests can control temperature, lighting, windows and TVs with just their phones. Similarly, Marriott is about to implement its “Internet of Things room” in select locations. This will include things such as digital frames to upload friends and family photos during a stay, as well as Amazon’s “Alexa” being available in the rooms. In addition to this, another technological change that will affect the industry is the implementation of “order and pay” apps for bars and restaurants. JD Wetherspoons was one of the first to implement this towards the end of last year. This allows customers to order to their table through an app on their phone. this essentially changes the typical order-at-the-bar service into a table service. In terms of value, Airbnb has already surpassed some of the biggest hotel brands worldwide. They have recently gained a £620 million investment from Google Capital, giving it a valuation of £22 billion. Airbnb accommodation will continue to draw business away from the larger hotels, especially where the growth in tourism is not as marked as it is in more popular destinations. Hotels will eventually Airbnb to find new customers. Booking services like Expedia typically charge hotels a 10% to 25% fee per reservation, whereas Airbnb charges 3%, so it wouldn’t be a surprise if big brand hotels started using the service as one of their marketing arms. Guests are becoming more focused on design, whether the hotel they choose is “big budget” or “bare minimum”. They want hotels that look and feel good to be in. Architectural trends include more natural light, open spaces and expansive sightlines. Focusing on style is becoming increasingly more important in the restaurant industry as well, with most young customers focusing on whether the food or location looks good enough to post on social media. Instagram is becoming a huge platform for food bloggers and critics alike to express their opinions of eateries, due to information being more consumable through images. For this reason, it is important that the food you serve not only tastes good but also looks good. More relevant for restaurants, veganism has taken off over the past few years, with a 360% increase in the number of vegans in the UK compared to 10 years ago. Because of this, the number of places offering vegan options has grown, with UK plant-based food sales growing by 1500% since last year. However, sourcing vegan-friendly produce can be quite costly, which will force people to focus on expanding the “Junk-food” options. If you are looking for head chef jobs and a hospitality recruitment company you can count on, contact us, we would be happy to help.